If you wanted to catch a glimpse of future warfare, you would've done well to watch the winter Olympics in Pyeongchang, South Korea. The opening ceremony featured a dazzling display of 1,200 synchronized drones. They lit up the sky and arranged themselves to form various Olympic-themed images. Previous generations would've thought this was nothing short of magic. But our generation? For us, it went largely unnoticed. We're used to seeing drones traverse the skies. Few people think twice when they see a single drone hovering in the air. Multiple drones moving in tandem and quickly shifting directions might catch our attention for a moment, but we don't give those much thought either. Maybe we should. In fact, as you watch video of the Olympic drones, ask yourself this question - what if those drones were armed? Synchronized drones let us see the future of warfare. Why do I say that? Let me ask you another question. Have you ever seen a large flock of birds flying in unison? They look like a cloud. And the whole flock can shift left, right, up, or down - all in a split second. Despite their quick shifts, these birds act as one. They aren't disorganized or disjointed. They fly in perfect harmony as if they have a single mind. We observe similar behavior in schools of fish, bees, locusts, gnats, and all sorts of animals. Now, imagine one of these groups is coming to get you. That's right. Imagine a swarm of bees is coming after you. Would a shotgun do you much good? Not really. You can fire into a swarm of bees, and you might take out one or more. But you know what? The swarm will keep coming. This is because the power of a swarm is decentralized. A single strike won't stop it. Sound scary? It should. Because this is the future of warfare. It's called swarm technology. As technology advances, synchronized drones will get smaller and smaller, faster and faster, and ever more powerful. In the near future, one nation will use them to attack a nation only armed with conventional weapons. 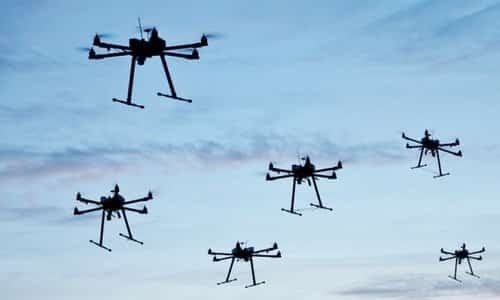 What do you think will happen when combat drones traveling like a swarm of bees attack a conventional army? How effective will tank fire or heat seeking missiles be when directed at a swarm? That's right. They'll be just as effective as firing a shotgun at a swarm of bees. Have no doubt, this is where our world is headed. Those nations who are first to develop swarm technology will rule over those nations who are slow to adapt. History has proved this lesson time and again. Think about it. Charging columns of soldiers were effective once - until machine guns arrived. Racing soldiers on horseback were once effective too - until armored tanks arrived. We can all cite countless examples of new military technologies making tried-and-true weapons and tactics obsolete. The same will prove true with swarm technology. And it will completely transform the world's current balance of power. For years, we've heard the next world war will be the final war on earth. Conventional wisdom says it's impossible for any nation to survive WWIII. Conventional wisdom says WWIII will annihilate all of humanity. Conventional wisdom is wrong. Why do I say this? Because conventional wisdom is based on the idea of mutual assured destruction (MAD). MAD is the belief no one can win a war between two nuclear powers. It's the idea that fear of total destruction will restrain any nation from provoking war with a nuclear power. Conventional wisdom assumes the doctrine of MAD will rule the world forever. In the current era, that may prove true. But it won't be true forever. Because a day is soon coming when MAD will be obsolete. We're about to enter a period of time marked by rapid technological change. If you think we've already been living in such a period, you're right. But the past hundred years of progress pales in comparison to what's around the corner. Technologies like artificial intelligence will give nations the ability to direct those swarms, analyze targets, and attack enemy networks. In such a world, the list of potential threats and attack scenarios will multiply, creating suspicion and distrust among the world's superpowers. A digital or high-tech Pearl Harbor will prove fatal. And that makes the world much more dangerous. Because fear of such an attack makes a pre-emptive strike much more likely. None of this should come as a surprise. Despite the idea WWIII will never come. And despite the idea WWIII will lead to complete global destruction, the Bible says otherwise. WWIII will take place. The Bible describes the Antichrist and his war of global conquest (Revelation 6:2-4), revealing there will be "war and slaughter everywhere" (Revelation 6:4). Yet the world survives this global conquest. How can this be? Because all eras come to an end. And the era of MAD will soon be over. New technologies will disrupt the foundation of international peace. Swarm technology, molecular manufacturing, artificial intelligence, and other emerging technologies will give unprecedented power to the one who wields them. Perhaps these technologies are the "great sword" described in Revelation 6 (Revelation 6:4). Perhaps not. Either way, the result will be the same. Emerging technology will put an end to MAD. The result will be a global war with death and destruction everywhere. And when the dust settles, a global empire will rule the world. The signs are everywhere. Jesus is coming!